The 11th edition of IDFAcademy Summer School will take place July 2-7 in Amsterdam. This year one of the tutors will be Paweł Łoziński. The workshops are addressed to first- or second-time documentary film directors, who are not students of any film school. 16 film projects in the script or editing phase (rough cut) were selected this year. During the script workshops the participants will work not only on their own project but also on the projects of others. The aim of the practical classes is an intensive work on building the script: transforming an idea into a story, building a strong narrative structure, choosing a protagonist, working on visuals. During the editing workshop the participants will be working hard on their project for three, four days under the watchful eye of experienced editors. The tutoring is there to help the filmmakers define the film's structure, identify the characters, build a story, achieve an appropriate rhythm and dramatic structure. Tutors at this year's IDFAcademy Summer School are: Niels Pagh Andersen, Gema Juárez Allen, Katja Dringenberg, Gitte Hansen, Aliona van der Horst, Menno Boerema, Jesper Osmund and Paweł Łoziński. Paweł Łoziński is a Polish director, screenwriter and producer of documentary and feature films. He graduated from the Directing Department at the Łódź Film School. He directed numerous documentary films including: "Birthplace" (1992), "Sisters" (1999), "Chemo" (2009), "Father and Son" (2013) and "You Hace No Idea How Much I Love You" (2016). He won prestigious awards at festivals in, among others, Bornholm, Paris, Leipzig and Krakow. 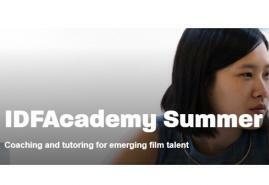 More about the IDFAcademy Summer School available here.